Patai's Chemistry of Functional Groups is one of chemistry's landmark book series in organic chemistry. An indispensible resource for the organic chemist, this is the most comprehensive reference available in functional group chemistry. Founded in 1964 by the late Professor Saul Patai, the aim of Patai's Chemistry of Functional Groups is to cover all the aspects of the chemistry of an important functional group in each volume, with the emphasis not only on the functional group but on the whole molecule. Professor Saul Patai founded the Patai Series. Structural Chemistry of Enones (B. Schweizer). Thermochemistry of Enones and Related Species (J. Liebman & R. Pollack). The Chemistry of Ionized Enones in the Gas Phase (F. Ture&ccaron;ek). Synthetic Uses of Enones (G. Boyd). Nucleophilic Attacks on Enones (D. Duval & G. Géribaldi). The Reaction of Enones with Electrophiles (K. Müllen & R. Wolf). Enone Electrochemistry (R. Little & M. Baizer). 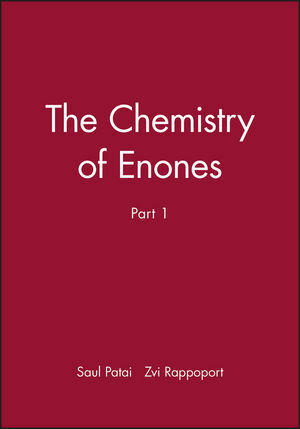 Radiation Chemistry of Enones (P. Neat & M. Dizdaroglu). Reduction of α,B-Unsaturated Carbonyl Compounds (E. Keinan & N. Greenspoon). Asymmetric Synthesis with Chiral Enones (M. Peel & C. Johnson). Dimerization and Polymerization of Enones in the Fluid and Solid States (C. Theocharis).